While we were at Rhinebeck my friend Muffin shared her girlfriend’s secret for making fantastic pumpkin bread: use your favorite banana bread recipe and substitute pumpkin for the bananas. It was one of those “Of course!” moments for me. 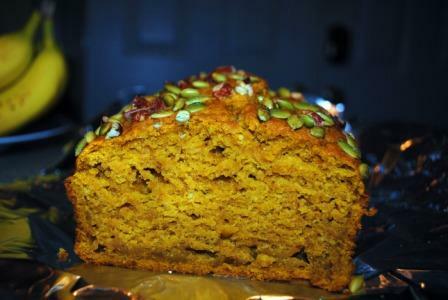 I usually use the banana bread recipe from America’s Test Kitchens Family Cookbook and as soon as I got home I set about adapting it to pumpkin. I used the same amount of canned pumpkin as it called for bananas, and added a generous amount of both ground cinnamon and cloves. 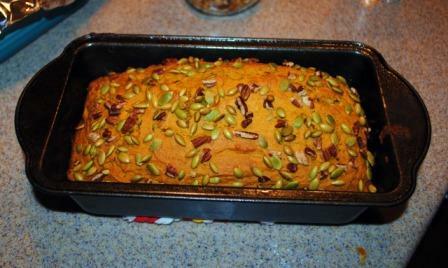 Then I sprinkled some chopped pecans and roasted pumpkin seeds on top. I’d tell you how it turned out but we’re all too busy stuffing our faces with it right now…………..